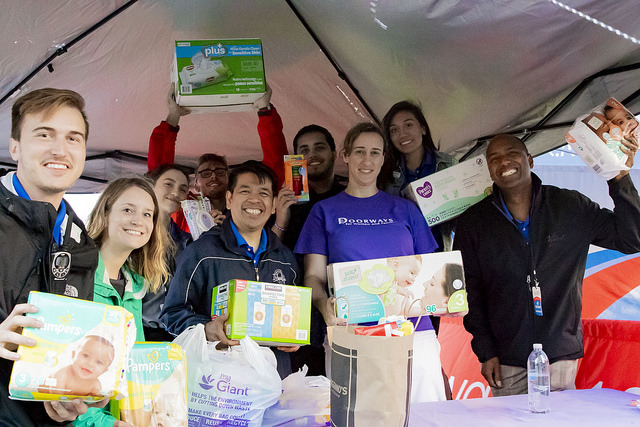 Listeners also took part in the “Hands and Heart” project to collect diapers and wipes for the “House of Ruth” in Maryland and “Doorways for Women and Families” in Virginia, two organizations which provide services for women and children who are victims of domestic abuse. Listeners gave hundreds of boxes of diapers and wipes as well as Metro cards. “We appreciate the opportunity to participate in this event. It gives us an opportunity to raise awareness about intimate partner violence within the community and is a chance for us to let individuals know that there are resources, there is help, and that there’s support from the community,” says Cassie Kelly, House of Ruth community relations coordinator. “WGTS is all about bringing the community together,” says Kevin Krueger, general manager. “It’s not just to enjoy a great concert though. We want the community to come together not just for entertainment, but also for impact. It is so gratifying to watch listeners step up time after time to help those who are struggling in the greater Washington, D.C. area. This is the third year of the WGTS 91.9 Summer Concert Series. The goal is to create a fun event for existing listeners as well as to introduce the general public to positive entertainment and an opportunity to give back to our local community.